Honda and Toyota are two Japanese car companies that everyone in the developed world has heard of before. They are also some of the leading manufacturers of vehicles with hydrogen fuel cell technology in them. Since the beginning of the 21st century, Honda and Toyota have experimented with hydrogen fuel cell vehicle models. Most of them have remained in Japan while some were introduced in the United States as mere concept cars. This hydrogen technology has been slow to become popular since the hybrid electric cars gained more attention back then. But now, the hydrogen fuel cell concept car is back and consumers seem to be interested in them. Below are the top 5 Honda Hydrogen cars. 2007 Honda FCX Clarity – The 2007 Honda Fuel Cell Experiment Clarity was the company’s new fuel cell vehicle which was introduced in Europe, Japan, and Southern California. Europe had already begun having hydrogen fueling stations at this point. 2016 Honda Clarity Fuel Cell – The 2016 Honda Clarity Fuel Cell was introduced to the American market in Southern California since the last Clarity model in 2008. Now with more hydrogen fueling stations and dealerships to sell this vehicle, it allowed more people to become interested in buying it. 2002 Honda FCX – The 2002 Honda Fuel Cell Experiment (FCX) was one of the first fuel cell vehicles produced by Honda. When it came out in 2002 it was actually a hybrid vehicle, but it was still the first to show off the true power of a hydrogen fuel tank. 2014 Honda FCV Concept– The 2014 Honda Fuel Cell Vehicle Concept showed American Californians what Honda was working on and what their fuel cell technology can do. This was only a concept car, but it led to the creation of their clarity models in 2016 and 2017. 2017 Honda Clarity Fuel Cell – The 2017 Honda Clarity Fuel Cell is the latest fuel cell vehicle by Honda. In California, there are only 12 Honda dealerships which are approved to sell this model vehicle. Six of them are in Southern California. Below are the top 5 Toyota hydrogen cars. 2015 Toyota Mirai – The 2015 Toyota Mirai is one of Toyota’s most popular hydrogen fuel cell vehicles. Priced at only $57,000, it is considered a luxury car and has since been sold in states all throughout the northeastern United States. 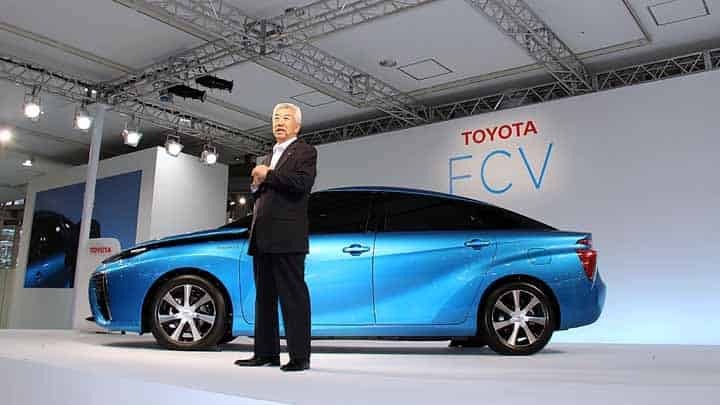 2014 Toyota FCV – The 2014 Toyota Fuel Cell Vehicle was a concept car which was first shown at the Tokyo Motor Show before it was sold in the United States. It was only sold in areas where there were hydrogen fueling stations. 2005 Toyota Fine-X – The 2005 Toyota Fine-X, also known as Fuel Cell Innovation Emotion-eXperiment, started as a concept car at the Tokyo Motor Show and later at the Geneva Auto Show. 2005 Toyota Fine-T – The 2005 Toyota Fine-T is actually another name for the Toyota Fine-X which was used in Europe and Japan. Both vehicles had very similar features and were some of the first to introduce four-wheel steering in a fuel cell vehicle. 2002 Toyota FCHV– The 2002 Toyota Fuel Cell Hybrid Vehicle was the first hydrogen vehicle introduced by Toyota. It was only available through a lease agreement to a limited number of American drivers. The response was encouraging but it would not get sold until years later. If you are interested in purchasing a hydrogen vehicle, you will need to research the locations of the nearest hydrogen fueling station. Since you can only drive within these areas, you won’t be able to take your hydrogen car on long trips where there are no fueling stations for it. That is why Honda and Toyota only chose certain dealerships to sell and lease these cars from. They wanted to be sure that consumers could access these fueling stations nearby.